Throughout the year, on every course that we run, cooks and kitchen assistants are needed o help with preparing meals. Generally, cooks are experienced in cooking for larger numbers (20-25 people). However, for those less experienced who are would still like take on a cooking role, we have set easy-to-follow recipes and provide mentoring and support. 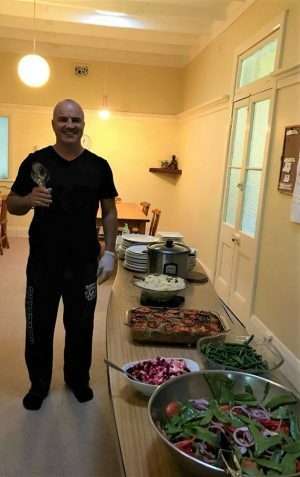 In conjunction with the retreat manager, they set the menu, provide the ingredients and supervise the work of assistants who help in food preparation. Cooks and assistants receive a free sitting day for each day of service. Sittings days can be redeemed up to half the value of the retreat. For example, for a 10 day retreat, up to five days can be redeemed meaning the retreat will be half-price. Click here if you would like to help in the kitchen. For some retreats there are opportunities for experienced meditators who are familiar with Centre routines to manage retreats. Our large grounds and gardens require continuous work, with tasks such mowing the lawns, weeding, mulching, raking and tidying. We also have a landcare plan to progressively eradicate weeds and regenerate native vegetation. Our regular group of volunteers performing this landcare and gardening work welcomes new members.